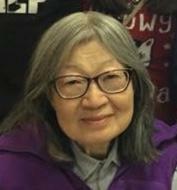 Teresa Sheau-mei Liu, 78, passed away September 25, 2018. Loving wife of Paul. Beloved mother of Christina (Michael Daleiden) Liu. Dearest grandmother of Cecilia “C.J.” and Anna. Adored sister of Rita (Stuart) Liu, Celina (Tom) Chen and the late Benno Wang. Admired sister-in-law of Mena Wang. Cherished aunt of numerous nieces and nephews.Teresa is a fine artist, graduate of National Taiwan Normal University Art Department. She attended graduate school at the University of Alabama in the Art Department. Prior to coming to the U.S. in 1963, she taught art to middle and high school students in Taipei (Beitou), Taiwan.